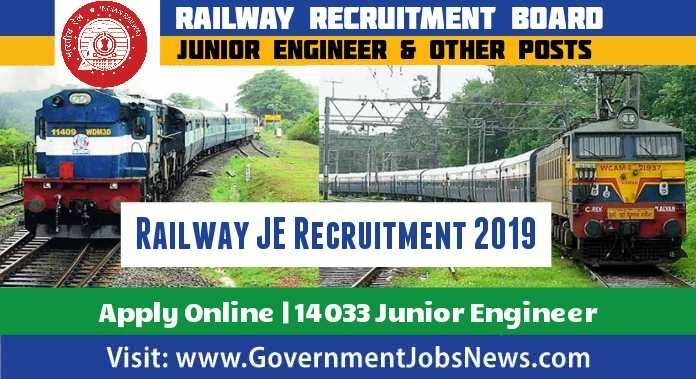 Indian Railway JE Recruitment 2019 Apply online 14033 Junior Engineer & Other Posts. 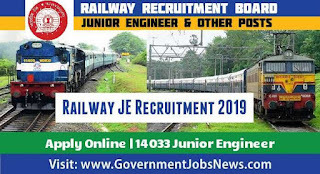 Railway Recruitment Board has invited application for recruitment notification for the post of junior engineer and other posts. Therefore Interested candidates can read the recruitment details and apply online. Related details are given below. Junior Engineer: Diploma/Degree in Engineering in relevant disciplines prescribed against various posts. Junior Engineer (Information Technology): PGDCA/B.Sc (Computer Science)/BCA/ B.Tech (Information Technology)/ B.Tech (Computer Science)/DOEACC ‘B’ Level Course of 3 years duration or equivalent from recognised university/institute. Chemical and Metallurgical Assistant: Bachelors Degree in Science with Physics and Chemistry with a minimum of 45% marks. Payment Mode (Online): Net Banking/ Debit Card/ Credit Card/ E Challan.